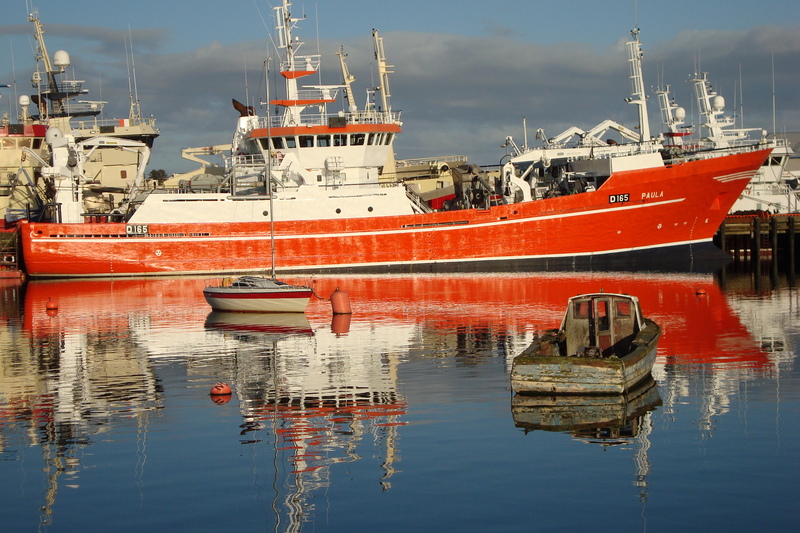 An Cealla Beag – Killybegs – the biggest fishing port in Ireland, whose name means ‘small stone cells’ otherwise known as ‘clocháns’. 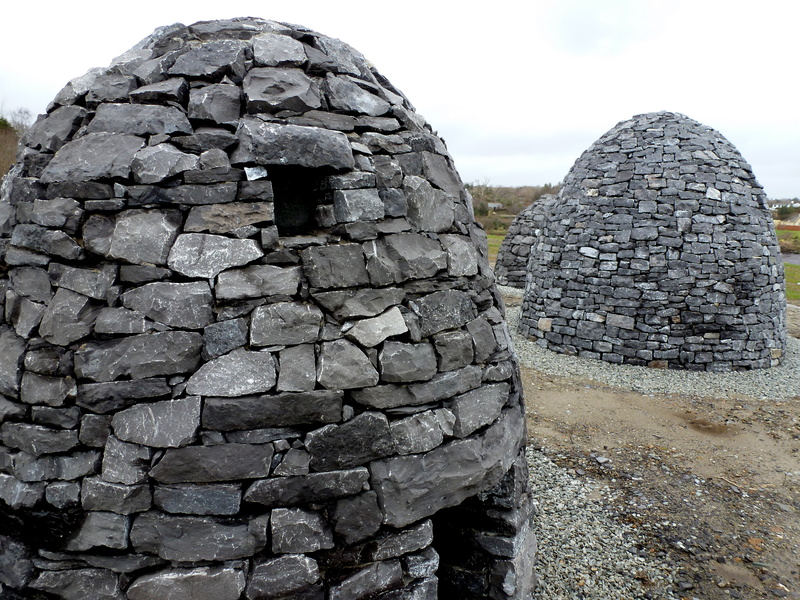 These beehive shaped buildings were monastic settlements and would have housed one or a few monks during their hermetical lives. 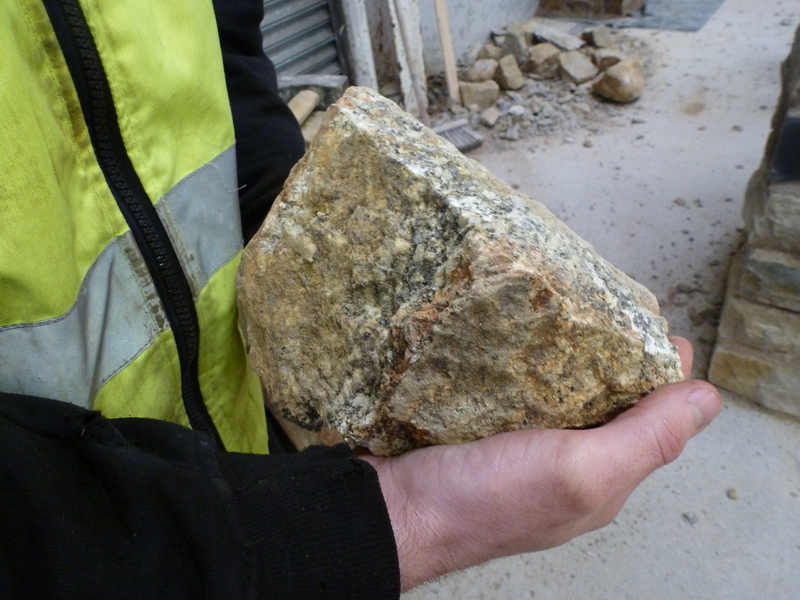 Recreated limestone clocháns at the entrance of Killybegs town – built by FAS! It’s hoped to create a park and picnic spot here eventually. It may have been the pure & curative water of a well dedicated to St Catherine that attracted the original religious community to establish, hereby founding Killybegs . 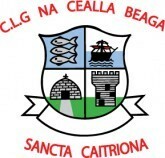 A clochán is depicted on the Killybegs Crest. 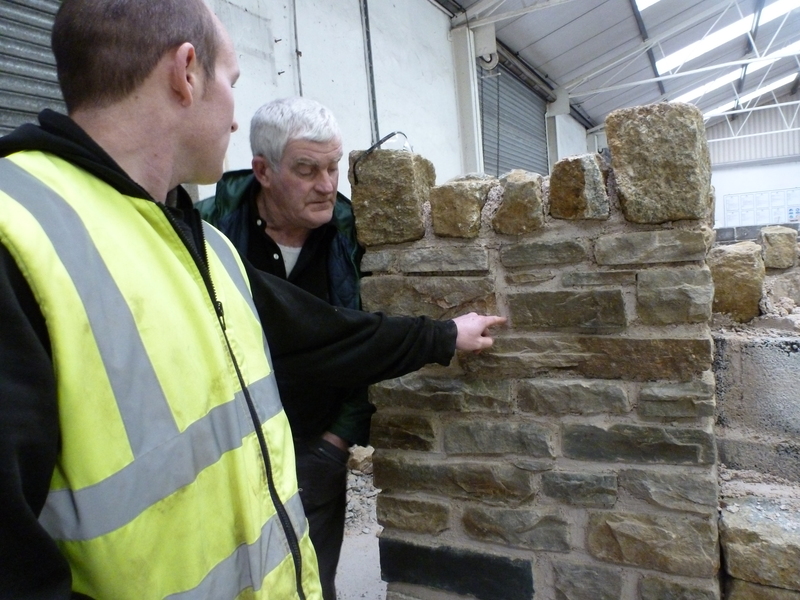 At Killybegs stone building course, supervised by Kieran Keeny, they work with granite. Apart from building clocháns, they’ve achieved a high standard in battered walls, pillars & arches; introducing a soft mortar that allows reuse. Did I mention splendid fireplaces?! What a beauty. 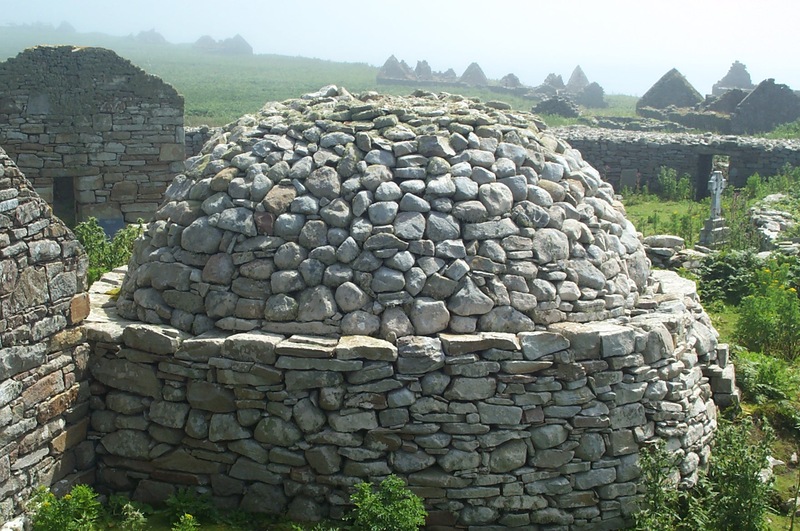 The most wonderful complete surviving clochán I’ve seen is on Inishmurray island off the Sligo coast. It’s quite sizable beneath its corbelled roof, with a stone bench surrounding. Posted in Clochán, corbelled roof, fireplace, GraniteTagged curative water, fishing port, monastic settlements, stone bench, stone fireplace, stonr foreplaceBookmark the permalink. 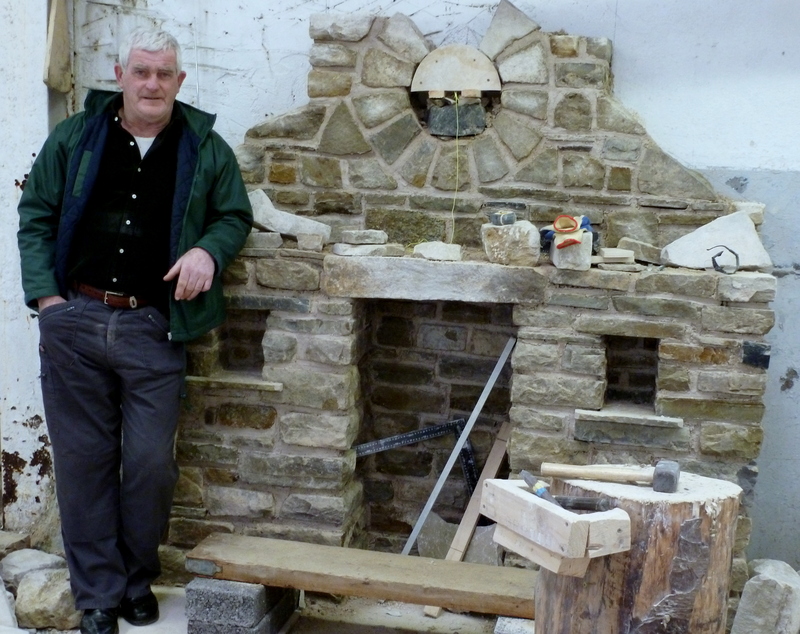 waw such beauty (clochán and fireplace).. I am happy learning more about Ireland by ready your blogs Louise! The clocháns seem to be a wonderful example of building with the most unlikely of materials, the stone to hand on a stormy coast, no wood or other structural augmentations, but they solved the arch/dome problem which didn’t re-emerge in antiquity until the Romans, even though the evidence is clear that the technique was known millenia before the Bronze age. Similar sensibilities shown in the Adriatic, Sparta & the eastern Med lands for the same reasons, little structural wood even though the conditions, lethally hot & dry, could hardly be less similar. Yet those clocháns would be cool in the heat and warm(ish) in Ireland.